Dermarolling / Microneedling / Webshop --> Paypal? Yes, we still only offer PayPal as a payment processor but we are working on an alternative. PayPal however does not require membership with them anymore. They process any ordinary debit- or credit card nowadays, issued worldwide. We have disabled PayPal's special German option of bank transfers though, because it is incompatible with our new web store. Thank you for your input, Firefox. Lino, you do not necessarily have to use Infadolan, the reason I asked was because a cream applied after dermarolling, which greatly enhances its absorption, could also cause skin reactions. Your skin reaction could have even been caused by the application of vit. C, if the skin was still a bit "raw" from dermarolling. "Hi Sarah I just used dermaroller again for the 2nd time and followed the same procedure as the 1st time per your instructions on your website I did nothing different from the first time I rolled . The 1st time I had no issues whatsoever the whole thing went smooth, this morning after rolling last night I woke up with a rash of sorts on certain areas on my face it looks like very small bumps the size of pores and I'm wondering what's happening because this didn't occur the last time?" "Fortunately, it doesn't sound like an infection. It might be a Retinoid (vit. A) rash even though it is more likely to appear after the application of the acidic form of vit. A such as Retinoic acid than with the non-acidic form that is in Infadolan. It doesn't sound like an allergic reaction since it didn't happened the first time at all. I have received a couple of emails similar complaints as yours but the red bumps simply appeared (on the chin and a part of the forehead) after rolling with a 1.5 mm roller, without any use of Infadolan or other retinoids and they quickly subsided. Do not use any vit. A cream for the time being and let me know how it goes." An infection starts two or more days after the injury. The skin becomes red, painful, swollen and warm. Sometimes a fluid runs from it and pus develops. It can be accompanied by fever, itching and the enlargement of the lymphatic glands. An infection should not be confused with inflammation, which is a short lasting reaction that appears immediately after dermarolling and usually lasts an hour or two. Inflammation is an immune system reaction to an injury. It is an initial stage of healing process. Infection is bacterial or other contamination of the wound. Also, do not confuse an infection with lasting redness from dermarolling or needling. Redness can last really long in some individuals, especially after needling. Everything you describe is completely normal. The skin is temporarily dry, sensitive and feels tight after dermarolling, especially after dermarolling with long needles. You have to keep the rolled skin very much moisturized (for example with almond oil). No, dermarolling doesn't have to draw blood. Over the counter numbing creams such as EMLA or Xylocaine contain a too low percentage of Lidocaine to completely numb the skin. It only reduces the pain. Higher percentages can only be administered by licensed medical staff. Dermarolling / Microneedling / A-Ret Q. We also are excited - it's a major improvement for us. We are re-investing our profits into machines to produce some of our own formulations. Ascorbic acid (Vit. C) is water-soluble, not fat soluble and it has difficulties penetrating oils. Water and oil do not mix unless you add an emulsifier. Most creams actually contain an emulsifier. The most efficient way to use vit. C serum is to apply it to your skin, wait for it to penetrate and then apply any cream you like. I acknowledge that this method is quite annoying and time consuming. You can mix vit. C into your cream but first dissolve the powdered crystals into a tiny bit of water. Mix the water into the cream. Basically, pour some of your prepared vit. C serum into your cream. For this purpose, make the vit. C serum more concentrated (add more vit. C). We now sell a very finely-grained ascorbic acid instead of crystals so it will dissolve even quicker. Finely grained vit. C powder may even dissolve in a cream without pre-dilution in water (it depends what the cream contains). You have to try it on a small sample and stir a lot. It will take some time to dissolve. If it doesn't dissolve in the cream, use the trick with dissolving it in a little water before adding it to the cream. The best is to use a small empty jar. In the jar, mix some of your cream and some of the fresh, highly concentrated vit, C serum (or add vit. C powder if it does dissolve). Use it up within one week (approximately) and prepare a new one. Keep vit. C serum in the fridge or prepare a new one every time you make a new batch of cream. This kind of skin reaction sometimes happens after dermarolling. It is rare. It is not an infection. Your skin just reacts like this. It mainly happens when you start with dermarolling because the skin is not used to it. I'm sorry it happened to you. The bumps will disappear. What kind of cream did you apply after dermarolling? There has been a lot of research done on the specified and real expiry dates of medicines by the US army. They found that expiry dates have little to no significance with modern production methods of chemicals, because it were contaminants that caused decay, for ex. with tetracycline antibiotics causing kidney damage after they expired. That does not happen anymore with modern production methods. Keep the tube in the fridge after opening and you'll be OK. Expiration dates are worse case estimations, to give a margin. Depending on the product, what can happen after the expiration date expires is a loss in active ingredient, the emergence of harmful substances, bacterial contamination etc. Retinoic acid may lose its potency when the cream does not contain sufficient stabilizers. There is virtually no risk of harmful substances or bacterial contamination, due to the formulation. If you kept the tube in the fridge, you can add years to the expiration date. The decay of chemicals is exponential with temperature and sometimes light or oxygen exposure. We won't be selling A-Ret in tubes soon, because we now started to produce our own A-ret cream and due to technical considerations, in 2012 we will be selling jars only. The whole A-Ret availablility problem has caused problems for a long time, and we think we finally found an acceptable compromise that won't require dropshipping anymore. Cheaper product and faster, more reliable shipping. I don't think Chloramine can damage the roller, so yes. To be honest I do no think that the reoccurrence of your Chloasma has anything to do with the number of needles. It is more due to quitting the acid peels or exposing your skin unprotected to the sun. Unfortunately, in many cases, lifetime maintenance is necessary to keep hyperpigmentation at bay. Hyperpigmentation in the epidermis is quite easy to remove but hyperpigmentation in the dermis (deeper part of the skin) is a big problem. I think the reason is that potentially, there is a risk of getting an infection. The depleted-vitamins story is indeed nonsense. If you get an infection, it will have to be treated with antibiotics and obviously, it is wise to avoid taking any medication when breastfeeding unless it is completely necessary. With proper disinfection and a normally functioning immune system, the risk of infection is extremely small and none of our more than ten thousand customers has ever reported an infection. Countless people all over the world are dermarolling. To minimize the risk, do not dermaroll extensive areas in one go. Do not roll all your stretch marks in one go. Wait for the rolled area to heal completely before you roll another part of the abdomen. And of course, thoroughly follow our disinfecting instructions. If you are pregnant or breastfeeding, you should not use any numbing creams. No, you should not needle moles. If your moles were checked by a doctor and they are not pre-cancerous, you do not have to avoid them when rolling but needling a mole won't remove it. >minutes and apply vitamin A. Any form of vit. A or any cream can be applied after vit. C as long as you let the vit. C penetrate into the skin first. >that a sufficient amount of time? >some just in case I needed it. I hope before the end of January. We're now manufacturing the creams ourselves and that's a major endeavor for us. We don't have the induction sealer out of customs yet. Scar tissue, whether raised, flat or indented is abundant in collagen but the scar collagen is thick and typically woven in a different pattern than in the normal skin. Scar tissue isn't really different from normal skin, however the thickness and patterns of the fibers are different. Crushing the scar tissue will crush the scar pattern of the fibers and the body will often remodel the scar into a better looking, softer scar. Our body does not fix something that is not "broken". Scar tissue is just a cosmetic problem, it is not perceived as "broken" by our body. Needling or dermarolling is a trick to make the body remodel the scar. Making tiny pricks is not enough to cause a scar but it is enough for the body to see needled/rolled skin as "broken" and trigger healing processes. Unfortunately, our body usually does not bother replacing the scar tissue completely with normal skin - especially when the scar is deep - but it often replaces it with a mixture of scar and normal tissue, producing a better looking scar. Needling/dermarolling triggers healing processes and the body tends to heal the area in a way, at least partially, as it normally should be. Indented scars fill in and raised scars flatten. It does not work in 100% of cases but in many cases it works. Whatever you use, always make a test patch first to see how it heals. When we get an injury that is serious, the body will quickly fix it with scar tissue to prevent an infection etc. The scar "glues" the skin together. Needling or dermarolling does not produce scar tissue. When you needle or roll normal skin, it will heal as normal skin. When you needle or roll a scar, it will often improve the scar but unfortunately, as I said, the body "refuses" to completely replace deep scars with normal tissue. Evolution apparently did not deem it necessary. So far, nothing exists that can completely remove a deep scar. You should not needle or roll keloid scars. It could make them grow larger. Your scars are not keloids. I think you have good chance in making your scars much less visible. You should definitely needle them but do not needle deep (needle about 0.5 mm or less). Needle all your scars densely every ten days. Your goal is to crush the hardened collagen bundles (scar tissue). To make the needling easier, safer and more efficient in this very thin-skinned area, the best way is to lift the skin between your fingers and then needle it but you cannot do this yourself. Someone would have to lift the skin for you or perform the needling while you are lifting the skin and I am not sure whether you would mind to ask someone. 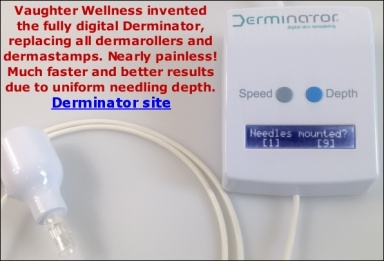 If you do not want to ask for assistance, buy a 1.5 mm one-liner dermaroller and target the scars. Needling is the most intensive treatment for scars but a one liner is also very efficient. Do not apply much pressure on the roller. Whatever you use, do a test patch first to see how it heals. - After needling, apply pressure with your fingers onto the scar spot by spot. Apply pressure to each spot quite strongly for about 20 seconds. Repeat the pressure massage daily (but only once in ten days in combination with needling). Once a month, roll the entire area with your regular 1.5 mm dermaroller (that you bought for stretch marks) but do not apply much pressure on the roller. Please keep us informed how it goes.